The Perfect Sitting and Standing Aids! 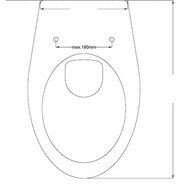 Our toilet seat boosters / standing aids are also available in a version suitable for very heavy users (up to 55 st. (350 kg)). Our child attachments can be delivered in association with the VAmat WC douche and for standard seats for single mounting from the Spahn Reha GmbH warehouse. These attachments are also suitable for older, underweight users. 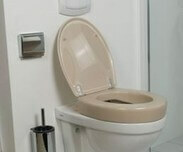 Standard toilet seats and anti-decubitus toilet seats by SPAHN REHA have a special stainless steel fastening element and can be optimally fastened to the toilet bowl in various positions using stainless steel screws. Closed porous material, to avoid the absorption of moisture. Easy accessibility to all parts of the seat can be folded up for optimum cleaning, removable without tools. Material suitable for disinfection.